Adkins Arboretum’s Summer Nature Camps give children the opportunity to enjoy their precious summer the old-fashioned way—outdoors! 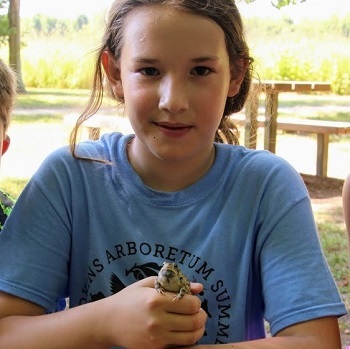 Campers will make new friends and lifelong memories while exploring the Arboretum’s woodland, meadow, stream, and wetland habitats. From grazing on blackberries to splashing in the Blockston Branch, the Arboretum’s Summer Nature Camps provide children with a truly enchanted experience. Registration is underway! Space is limited, and advance registration is required. A $10 sibling discount is available. Register your young adventurer to grow with the Arboretum. Camp Bumblebee (ages 2–3): June 17–21, 10–11:30 a.m.
Camp Paw Paw (ages 7–9): July 8–12, 9:30 a.m.–12:30 p.m.
Camp Egret (ages 10–12): July 15–19, 9 a.m.–3 p.m.
Click here to submit camp forms.